Blue Mammoth is an autoflowering Indica-dominant Marijuana strain. Besides being easy to grow, it is collected in 10 weeks. Its aroma is pungent and intense, reminding the Skunk Marijuana. Blue Mammoth is an autoflowering indica-dominant Marijuana strain created by the Barney's Farm seedbank. Is a genetics originated from a cross between the Blue Cheese and the famous Skunk #1, then crossed with a Siberian ruderalis that gives it the autoflowering genetic trait. 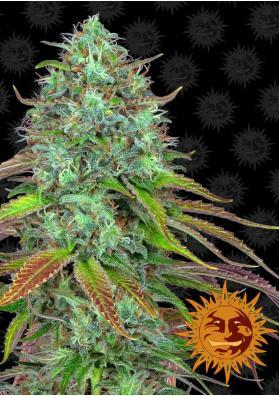 This Cannabis strains reaches maximum heights of about 80 cm and its marked indica tendency makes it develop a branched and bushy structure, with many bud tails. Blue Mammoth very easy to grow and is not sensitive to excesses or shortages of fertilizers. Besides that, it is resistant to mold or other fungi tolerating fairly well temperature changes. Due to its Indica structure you can put one plant close to another thus allowing a better use of the growing area and being suitable for small cultivation spaces. If you want to potentiate the outcomes we recomed to cultivate it using the Sea of ​​Green (SOG) technique, an intensive indoor cultivation system and also to make an apical pruning, or, if you dare, a Supercropping; both give great results. It is harvested after 10 weeks and produces up to 30 grams per plant making it an ideal choice for commercial growers. The buds of Blue Mammoth are very large, and when dried, they become tough and compact. Blue Mammoth has also an interesting THC content (more than 10%). Its scent is quite penetrating and is felt before the crop maturation so we recomend to use anti-odor filters.